I’ve been on the Las Vegas to Columbus flight often enough to know the flight path usually takes us over the northern end of the San Luis Valley in Colorado with a nice view of the Sangre de Cristos to the south (many of them over 14,000 feet), along with the Great Sand Dunes nestled up against the mountains. I have a sentimental attachment to these mountains. Growing up in Colorado I spent many a happy hour in the “Sangres”, the affectionate short name the locals have for these mountains. The Photographer’s Ephemeris for January 28, 2017 over the Sangre de Cristo Mountains. Click for a larger version. The wrinkle in my photography plan was our departure time from Las Vegas which would put us over the Sangres well after sunset. Would there be enough light? The answer, just barely. We crossed the Sangres at 5:54 pm Mountain time, 34 minutes after sunset and 5 minutes after the end of civil twilight. At this time of day it is getting pretty dark. Without the highly reflective snow this image would be dead. But there was still some light painting the snow covered peaks and I wanted to catch some of the magic of the fading light. Even with the camera ISO set to 3200 my shutter speed was 1/13 second, slow for a smooth plane ride, much less a bumpy ride. I could have kicked the ISO up higher to get a faster shutter speed but at ISO 3200 I was already pushing the noise limits for this scene. A higher ISO would have put the digital noise over the top. 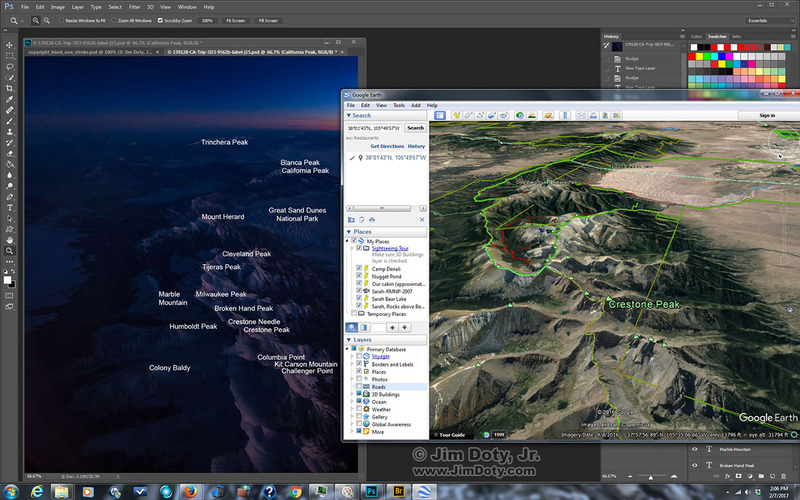 Adobe Bridge, photos of the Sangre de Cristo Mountains. I took quite a few images as we approached and crossed over the mountains. 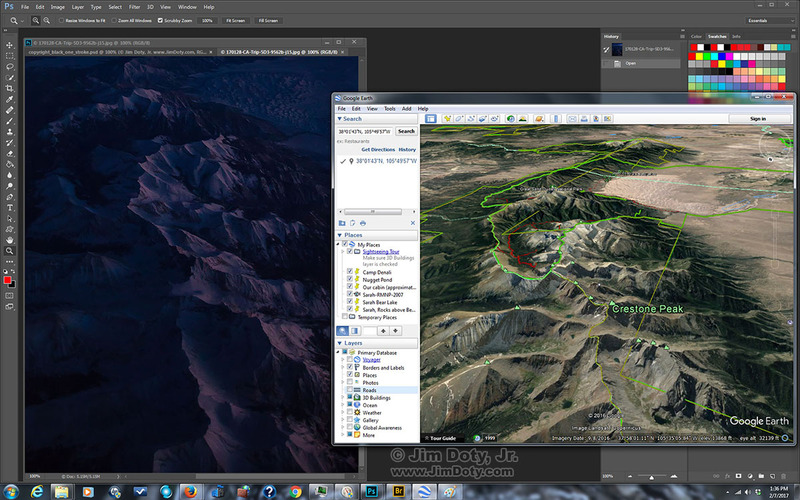 This Adobe Bridge screen capture doesn’t show all of them. Most of the photos were a bit blurry due to the bumpiness of the plane ride. There was no time to chimp until the scene had passed. Chimping might cost me a sharp image during a non-bumpy moment, so I just kept clicking away. On a less bumpy ride you might have a few seconds of calm to time your shots. On a really bumpy ride you have no way of knowing in advance when the good moments will arrive so you just keep shooting and hoping. The shot at the top was one of the few sharp images. 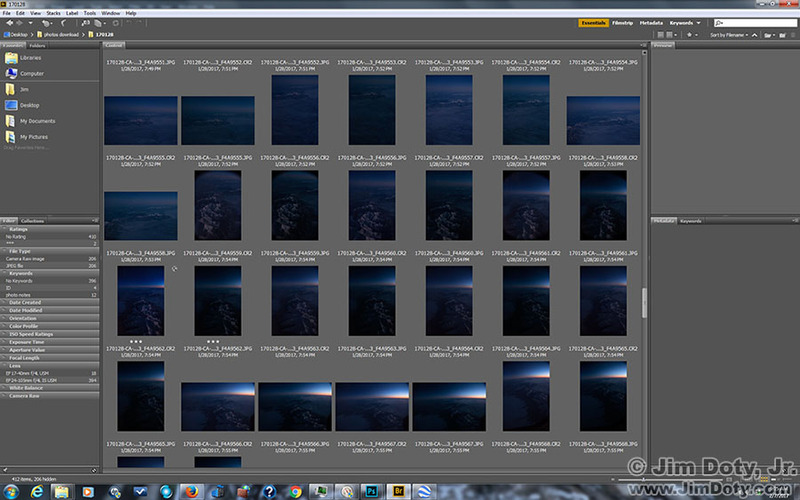 So don’t put your camera away after the sun sets, even on a plane. Crank up the ISO and hold the camera as steady as you can. Don’t rest your elbows on the arm rests, seat, or tray table or you will transmit the vibrations of the air-frame to your camera. Don’t lean back against your seat for the same reason. Use your body as a shock absorber to soak up the vibrations. Photography from a commercial jet can be a low percentage proposition. If you don’t get any good images on one trip, try again on your next flight. You have nothing to loose and some memorable images to gain. Sangres photo location from Google Earth. Click for a larger version. Have you ever looked at a photo from the air and wanted to know about all of that stuff down below? Thanks to the wonders of modern technology, you can. Google Earth can take you close to the location up in the sky where your plane was and give you a similar point of view. More about that in this article. The Sangre de Cristo Mountains looking north. Photo Data: Canon 5D Mark III. Canon 24-105mm lens at 24 mm. f/5.6, 1/13 second, ISO 3200. Colorado Fall Color Travel Guide – The Sangres are beautiful in the fall, as is the rest of Colorado. Check out my extensive travel guide with over 100 photos and 17 maps. 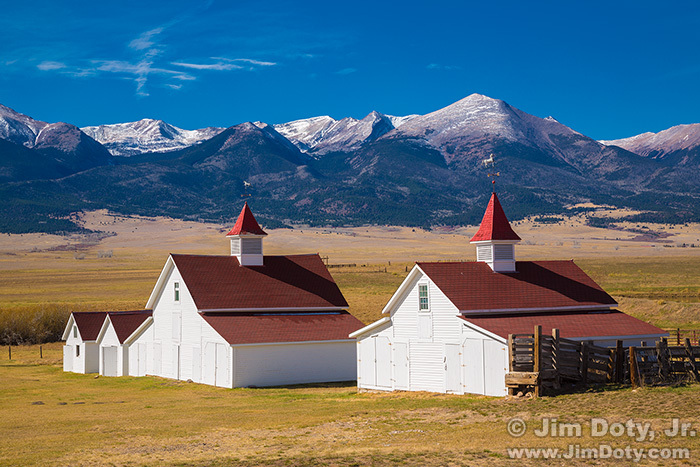 Sangres.com – for those who love the Rocky Mountain West. 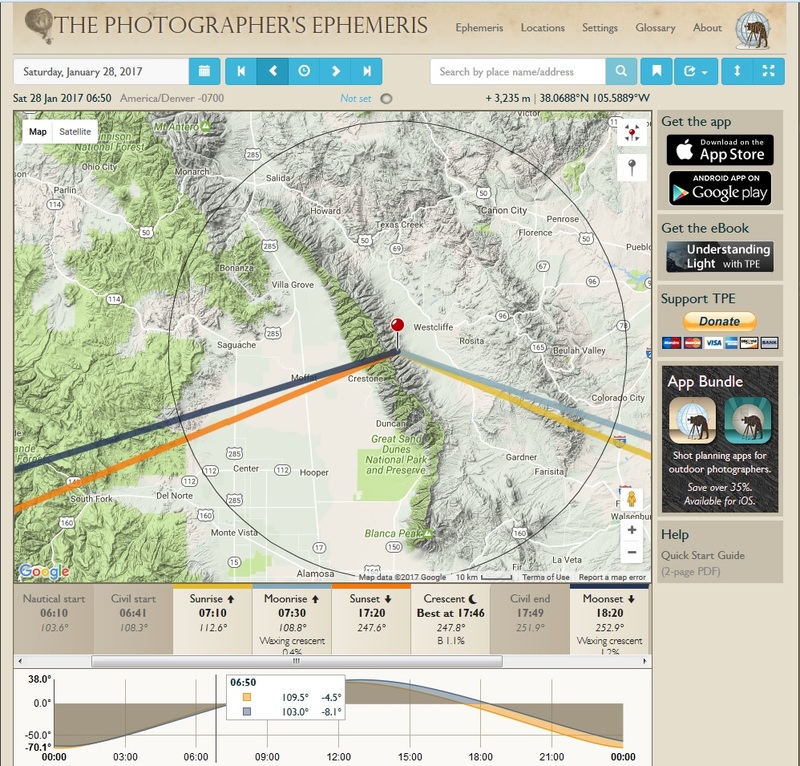 The Photographer’s Ephemeris – TPE is a terrific tool that provides both the time and direction of sunrise, sunset, moonrise, and moonset for any place on the planet at any date of your choosing. If you want to plan ahead to be at O’Haver Lake when the moon sets behind Mt. Ouray, TPE will tell you the day and time to be there. TPE is available as a smart phone app and there is a free desktop version. 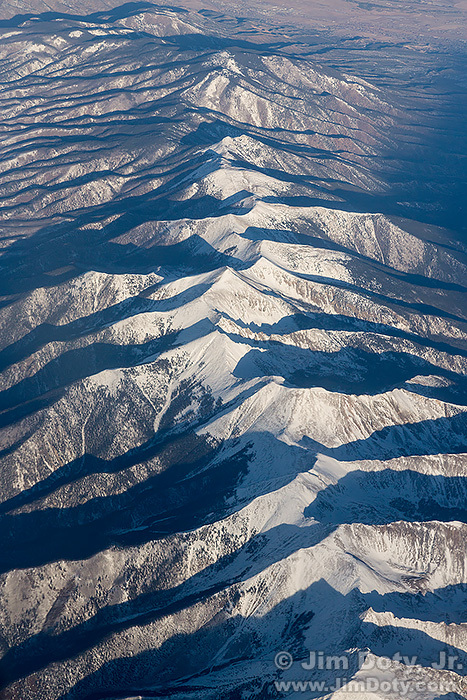 Aerial photo of the Sangre de Cristos by Wojtek Rychlik. Click for a much larger version. 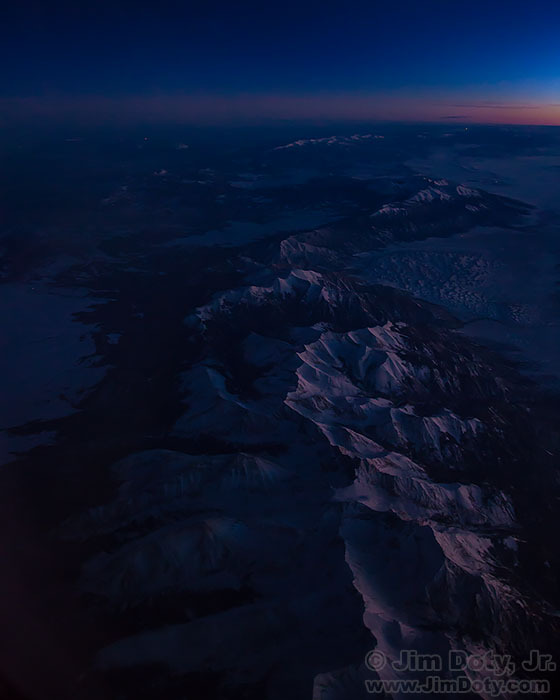 Aerial Photos of the Colorado Rockies by Wojtek Rychlik of Pikes Peak Photo. This entry was posted in General, Photo Locations, Photographs, Techniques, Using Equipment by Jim. Bookmark the permalink.